You'll see why through their hand-pressed tortillas and an ambitious tasting menu. They will boldly tell you theirs are the best tacos in town, with the bravado of those who have come from elsewhere to stake their claim and have worked hard to get here. 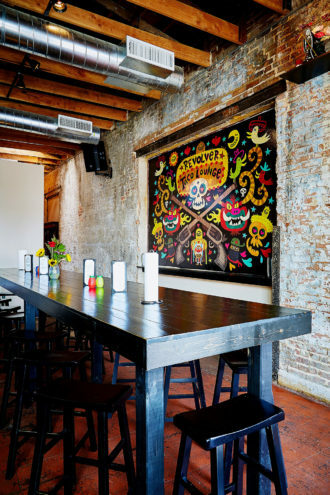 Is the Deep Ellum iteration of Revolver Taco Lounge revolutionary? In its format, it is. It’s a taqueria out front—only six tacos on the menu; the kitchen is that small—in a space that intentionally channels the gritty, with artful graffiti emblazoned over the cooktop hood. 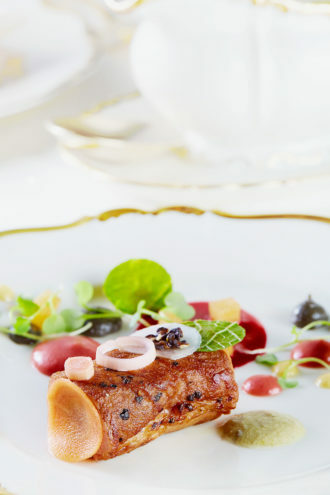 A prix-fixe tasting-menu room occupies the back, where owner-chef Regino Rojas, with the help of chef Hugo Galvan, is finally doing what he has wanted to do all along. The a la carte dinner menu at Rojas’ Fort Worth restaurant features goat birria, which he recently added to the Deep Ellum lineup. As he and Galvan take on regional Mexican, you will find a mix of nostalgia and modern flair. If the tacos are the best, it is because of the tortillas, pressed to order by a woman who turns them out, round disks of masa that have barely agreed to leave their state of fresh dough to be flattened in the wooden press, then flopped on the comal griddle until they puff and settle, plump and golden and so good. On my first visit, I’m smitten by the pulpo taco, a whole octopus tentacle, soft as butter, with jalapeño salsa and a thatch of frizzled leeks. Once you become a regular, you see them plated, three or four to an order, as though there were no other taco in the world. Grilled rib-eye carne asada and duck breast come garnished with caramelized onions and roasted poblanos, both simple and intensely flavorful. Firm, beer-battered mahi mahi comes with cabbage slaw, pickled onions, and sprigs of parsley that pair brilliantly. And vegetarians will be glad to know that the veggie taco is not an afterthought. It comes al dente, the calabacitas (Mexican squash) in big juicy cubes, the corn crunchy-sweet and queso fresco plentiful, the filling’s freshness matching the pure flavor of the masa. One night, tripe made an appearance, creamy and potent with the intensity of liver, a secret pleasure that’s not for everyone. The prices reflect sourcing. “We have a badass airport,” Rojas says on the phone. And the price of quality and freshness is passed on. You’ll pay $5 for the mahi mahi, $7 for the duck. They’re winsome tacos, conceived as pieces d’art. One look at the spectacular pulpo and you know. The reservation- only prix-fixe menu has dishes like pork loin with mole verde; one long communal table and a small stretch of bar are the spot for tacos. But nothing is more ambitious than the tasting room in the back—named Purépecha, after the major indigenous tribe of Rojas’ native Michoacán—a room tucked at the end of a hall, where three tables present elegant dreamscapes. One evening, I found myself solo for the second seating (8:30 pm), at my table a single red tulip. Plates are gold-rimmed, and an antique gramophone plays Mexican ballads. It’s the intimacy of a mother’s house. They are not trying to be upscale, but rather to bring you into a traditional kitchen, where the table is nestled up close to the stove. On one wall are cazuelas and copper pots; on the other, the demonstration kitchen where you will watch Galvan mastermind the evening, forgetting that down the hall is a taqueria and a Deep Ellum crowd. Galvan’s background includes fine dining establishments in San Miguel de Allende and Cabo San Lucas and, more recently, Stephan Pyles’ Flora Street Cafe. Take note of the books by the gramophone: Grant Achatz’s Alinea, a towering inspiration of molecular gastronomy, and the regional Mexican Modern, with pre-Hispanic depth. What Enrique Olvera has been doing at his internationally famous Mexico City restaurant, Pujol, launching a frenzy of interest in mixing the indigenous and the modern, is relevant in Rojas and Galvan’s kitchen. Here, we have an interpretation, developed, you feel, for their pleasure. First, a version of chayote and calabacitas soup, pretty pale yellow, though amped up on salt. Scattered around the bowl’s broad edge are daubs of a corn purée (seemingly with a kiss of tequila) and a vaguely sweet purée from the ash of charred tortillas. Next, an interlude with a scallop crudo. Then two tacos: a sliver of Wagyu beef has been carved mostly from the fat and I miss the hallmark marbling; lobster, though, is terrific, sweet beyond belief, with a guajillo butter and jalapeño salsa. If you’ve had the pulpo taco, it’s close, but elevated unequivocally. You’ll pay $5 for the mahi mahi, $7 for the duck. They’re winsome tacos, conceived as pieces d’art. One look at the spectacular pulpo and you know. In the second part of the menu, I’m served moles based on Rojas’ mother’s recipes—almost less family recipes than part of a community and region’s fabric. Pipian, a green mole typical of Michoacán, is mild in color and rich with pumpkin seeds. It’s served with tender pork loin, rolled in a pan for a light sear—not cooked sous vide, as they initially thought they might. Dark fruit jellies of membrillo paste and dots of guava purée beg you to cross-examine them for relevance. But get them in the same bite as the pipian and they are doing something more than decoration, lifting the spices through their sweetness in a kind of alchemy. This is what Rojas and Galvan desire: to remain traditional but push presentation. Duck seems destined to marry with the mole rojo it’s laid over—not chocolaty Oaxacan mole, but a carmine lake, lighter but still deeply right with the juicy duck, strong in flavor and tender. If the rice served alongside was a letdown, it’s because we’re primed for something more. The taqueria’s menu also has a section of raw seafood in the form of ceviches and crudos. Every time I ordered from it, I regretted the move. A Yucatán-style ceviche offered red snapper with wilted microgreens and tomatoes pale as specters. At $18, this and its companions represent a strange divide from the taco prices. A Cape Hatteras oyster that hadn’t been loosened from its foot made for an awkward, slippery struggle mid-bite, and crowning salmon roe pearls were overwhelmingly fishy. On the other hand, an impeccable Spanish prawn Rojas was developing one evening for the Purépecha menu was glorious, butterflied and grilled under the salamander, brilliant red and bursting with soft, juicy tail meat. He’d showered it judiciously with parsley, garlic, and lemon, and its juices ran flavorful with smoked paprika. They’re still figuring things out, working with their vision for the two spaces. They’d like brunch. A whole branzino with salsa verde that a table might assemble into their own tacos; mushrooms—perhaps morels—for a vegetarian version of the prix-fixe menu. It’s a work in progress. With a few refinements, it could be unforgettable. At the end of the evening that I dined solo, Galvan joined me for a sip of Don Julio 1942. The gramophone now swelled with the strains of the Mexico City symphony orchestra. The music down the hall had started thumping.